American Airlines employees can use the American Volunteers tool on Jetnet. If you are not an American Airlines, American Eagle or American Airlines Federal Credit Union employee, please contact us. We will work with you to find just the right volunteer opportunity. It's the BEST Experience, but Don't Just Take Our Word For It . . . There is a quote by Winston Churchill that is inlaid in the tile of the pool area at the village - "We make a living by what we get. We make a life out of what we give." I believe those words truly capture the feelings and motivation for all the volunteers with Something mAAgic. Thanks for letting me be a part of the magic and I look forward to many years to come! 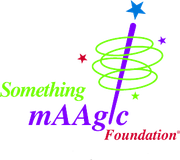 The Something mAAgic Foundation is a nonprofit organization exempt from federal income tax under Section 501(c)(3) of the Internal Revenue Code.